The summer is finally heating up! But that’s not all that kept us busy in May. Read on to learn about the latest happenings at JAF! After months of planning, designing, testing, and focus-grouping, we were thrilled to launch the new JoeAndruzziFoundation.org website in May, as well as the catalyst for our new makeover: JAF’s new branding. Front and center of the rebrand is a new JAF logo – a significant departure from its two previous iterations, both of which prominently had featured a silhouette of Joe, football helmet, pads and all, triumphantly raising his hand towards the sky. The new Joe Andruzzi Foundation logo expresses the Foundation’s warmth, dedication, and positive approach to cancer support combined with a subtle but central reference to Joe’s football career – the sport that gave Joe a platform to speak from when he and Jen launched the Foundation nearly 10 years ago. Follow this link to learn all about our recent changes! 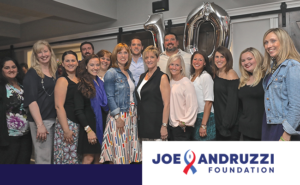 On May 22, the Joe Andruzzi Foundation turned 10 – and to help celebrate our big milestone, our amazing friends at J. Derenzo Companies challenged our donors with a one-day, dollar-for-dollar match. 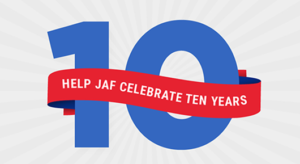 By the end of the day, our 10th anniversary day-of-giving raised more than $112,000 in support of the New England cancer patients JAF serves! Please help us send a HUGE thank you to J. Derenzo Companies for their incredible kindness, as well as to the generous donors who contributed to the fundraising campaign! Missed out on the Falmouth Road Race lottery? Still looking for an entry? 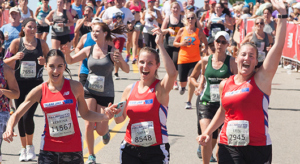 Apply today to run the 2018 New Balance Falmouth Road Race on August 19 for the Joe Andruzzi Foundation’s Team JAF squad & raise funds to support New England cancer patients along the way! Already have an entry? We are also accepting applications from those already in possession of a bib who wish to run and fundraise as part of a non-profit team. The Joe Andruzzi Foundation returns to Pinehills Golf Club in Plymouth, Mass. 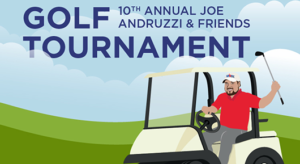 on Monday, June 25 for the 10th Annual Joe Andruzzi & Friends Golf Tournament, presented by East Commerce Solutions, Inc.Last year’s tournament raised $300,000, and proceeds from this year’s event will once again benefit JAF’s mission to provide help, hope, and a reason to smile, for New England cancer patients and their families by contributing financial support when it is needed most.To guarantee your spot in this year’s event, register today! When Anne Freeman learned she had cancer, she was in the most fortuitous place: the parking lot of her spiritual director. The 53-year-old Roslindale mother works in deaf ministry and was on her way to her monthly appointment with her director, who helps ministers nurture their own relationship with God. Her phone rang. It was the surgeon who had recently removed a grape-sized mass from her uterus. The biopsy revealed cancer, she told Anne. “As she was talking to me, I had this vision of a giant hand holding me,” Anne remembers. After she hung up, she went in to see her director and they talked it through. It was the perfect place to be. Follow this link to read the full story behind Anne’s inspiring cancer journey. 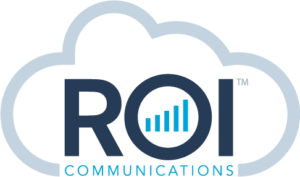 Joe DeStefano, President: ROI is a professional consulting and sales organization servicing the Telecom, UCaaS and Cloud Computing Industry. JAF: How did you (Joe) hear about the Joe Andruzzi Foundation? What made you want to get involved as a Board Member and then as a Champion? Joe DeStefano: I became a supporter of JAF because I felt compelled to pay it forward in some way. Getting to know Joe and Jen and seeing firsthand what the Foundation was providing to local families in need really helped me cement my decision to join the board. I knew this was a great opportunity and place to make a difference. I really appreciate the community aspect and impact we have. I decided to have ROI join Champions Circle because I knew it would be a great opportunity for my staff to also get involved with this important mission, while also promoting our business and connecting with other business owners. JAF: In 2017, ROI joined Champions Circle at the ‘Fan’ level and in 2018 upgraded to ‘MVP’. What was the driving force behind that? Joe DeStefano: ROI upgraded to an MVP because we believe in the sustaining power of the Champions Circle membership. JAF: Anything else you want people reading this to know about ROI and or JAF? Joe DeStefano: My favorite thing about being part of the Foundation is hearing from families and individuals about how our work has truly helped them, not just by providing monetary relief but by helping them better cope mentally and emotionally with the challenges ahead. 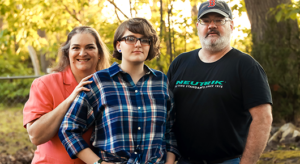 Champions Circle is the Joe Andruzzi Foundation’s new giving society designed to recognize exceptional businesses who want to play a key role in emotionally and financially supporting New England cancer patients and their families through their cancer journeys. The program is focused on highlighting businesses and business leaders who commit to making an impact locally with their annual gift to JAF. As a member of Champions Circle, you join like-minded business leaders who share a commitment in supporting cancer patients with impact at a local level. For more information, please visit www.jafchampionscircle.org.